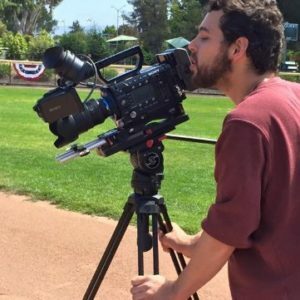 Reid Davenport is an award-winning documentarian whose films focus on people with disabilities. The founder and co-director of Through My Lens, Davenport has been creating films and public speaking for five years. As a man with cerebral palsy, his hope is to inspire disabled students to share their personal stories, as he has done. He says that “there is a tremendous space for amateur videos now on YouTube and social media and a few people with disabilities have already grasped that fact and taken back the narrative and that’s what we want to encourage, take back and start to chip away at the misrepresentations of disability.” Reid’s short film On Beat, co-directed by Cheng Zhang, follows Larry and Tanisha Cotton, a Deaf couple with three hearing children. The family uses music as a means of bonding and expressing themselves. Davenport and Zhang discovered this family with another story in mind, having heard about Uber's efforts to hire Deaf drivers (Larry is a driver), but once he came across the Cotton’s gospel group, he knew he had a different story to tell. The Cotton Family featured in Davenport's film "On Beat"